Peter Yared is a smart guy. Since he started writing games and utilities at age ten, he’s founded and sold multiple tech companies. Recently, he left his post as CTO of CBS Interactive to launch another one. Recently, Peter wrote about innovation on Techcrunch, specifically addressing the coming fight between upstart Tesla Motors and incumbent BMW around electric cars—which is, in his words, a real-life Innovator’s Dilemma. It’s a rebuttal of sorts to Jill Lepore’s claim that disruptive innovation, an idea championed by Clay Christensen, is overrated, and perhaps a mirage. If you saw the episode of the HBO sitcom “Silicon Valley” in which the characters attend a conference called TechCrunch Disrupt 2014 (which is a real thing), and a guy from the stage, a Paul Rudd look-alike, shouts, “Let me hear it, DISSS-RUPPTTT!,” you have heard the voice of Clay Christensen, echoing across the valley. Leopore has some very valid concerns, many of which I shared when I first read the Innovator’s Dilemma. Weren’t some of the ephemeral, fleeting companies Christensen mentioned still around, despite his claims that nobody survived innovation? As Leopore puts it, when Christensen says, “Nowhere in the history of business has there been an industry like disk drives,” that makes it a lousy tool for looking at how other industries grow and fail. I’ve found several common threads among the large companies I’ve spoken with about innovation. Many of these are borrowed liberally from Christensen and Moore and Anseff and others. One of the most useful ideas to emerge from this is that of the three maxima. There are three kinds of innovation: sustaining, adjacent, and disruptive. Generally, there are three groups tasked with these three forms of innovation, and they all have different metrics, personalities, and ways of working. They’re maxima, because each group is striving to optimize their particular area of focus. Someone doing sustaining innovation is only going to improve things to a certain degree—their local maxima—without changing the rules of the game somehow and moving to a new, global maxima. Sustaining (or core) is more of the same (or as Coke’s Zyman’s said, “more things to more people for more money more often more efficiently.) It’s not innovation, per se; it’s doing your job. It’s giving the market more of the same, and doing so better. It assumes tomorrow will be like yesterday, only more so. Many of the Lean Startup methods—constant experimentation, close customer development, rapid prototyping—work well here, but this isn’t startup work. Adjacent is changing one aspect of an offering, generally the product, the market, or the method. Amazon first sold an existing product (books) to an existing market (readers) with a new method (centralized logistics and web ordering.) Then they launched a new product (e-reader) which eventually let them target a new market (legally blind, whose selection of large-print books was very limited.) Astute readers will recognize Anseff’s matrix in this, but I like to add “method” as a clear reminder that it’s about not only what you sell and who you sell it to, but how you sell it. Disruptive (or transformative) generally cannibalizes a different, existing market. Most of the innovations we hear about today aren’t really disruptive; the word just sounds cool. But some things are: Google Maps is disruptive because London cabbies don’t need The Knowledge, paving the way for Uber. Skype undermined long-distance phone services. Amazon Web Services changed the server market forever. Disruption often comes from reframing: Blockbuster was in the video rental business, while Netflix realized it was actually in the entertainment delivery business, which made it easier for the company to realize the US postal service could be turned into high-throughput, high-latency broadband by mailing DVDs. A 2015 model Mercedes is sustaining innovation: more of the same. Car2Go, the Mercedes/Smart venture, is disruptive. If it succeeds it destroys the dealership network. With Mercedes, we have all three maxima happening at once. For another example, consider P&G. They continually change the color, fragrance, packaging, and marketing messages around their cleaning products—that’s sustaining innovation. At the same time, they introduce new products (such as the Mr. Clean Magic Eraser, which was originally aircraft insulation); and they enter new markets. That’s adjacency. But what about disruption? There are plenty of upstart competitors using smartphones, ratings feedback, and digital payment to try and build new cleaning companies. If one of them succeeds in a significant way, it’ll change how cleaning products are bought and used. Should P&G launch a home cleaning service? Should it at least be trying? By definition, it always threatens the existing business model, and those of potential partners and channel members. After all, if a startup is, as Steve Blank says, an organization designed to search for a sustainable, repeatable business model, then it follows that a big company is an organization designed to perpetuate one. Executives expect to see a business plan, which must stem from a business model, which in turn stems from a variety of assumptions about the market and what it will value. But launching a truly disruptive innovation project is a search, and asking for a business plan is like asking Magellan to draw a map of the world before he’s even set sail. Corporations have a stated business goal. It’s in their charter, and their board documents. If you’re running a garbage disposal company, it’s unlikely you can launch a streaming music service—it’s outside the scope of your operations. While sustaining and adjacent innovation require framing to guide where they look for improvement, disruption is generally unframed. Capital markets don’t let companies invest more than 10% of their time in disruption, and studies show that 95 to 99 percent of attempts to enter a new market will fail. So the math, historically, doesn’t work—even though current models of innovation and the rate of change of industries have probably adjusted these ratios in recent years. A few companies do disruption well. Google is frequently cited, having introduced Glass, Maps, the self-driving car, balloon-based wifi, and so on. Part of this is the company’s culture, and its decision to let employees innovate on their own projects. Part of it is the hugely profitable advertising engine that generates cash with which to experiment and dabble. Part of it is the isolation Google is willing to give its disruptors. But other companies need to recognize that a significant factor is Google’s broad charter of organizing the world’s information, which gives it considerable latitude. Netflix is in entertainment delivery; Mercedes is in transporting things; P&G is in creating clean surfaces. Framing the value your market gets from your business properly is the first step in figuring out how to disrupt yourself before someone else does. This was really insightful and educational, thanks for sharing. 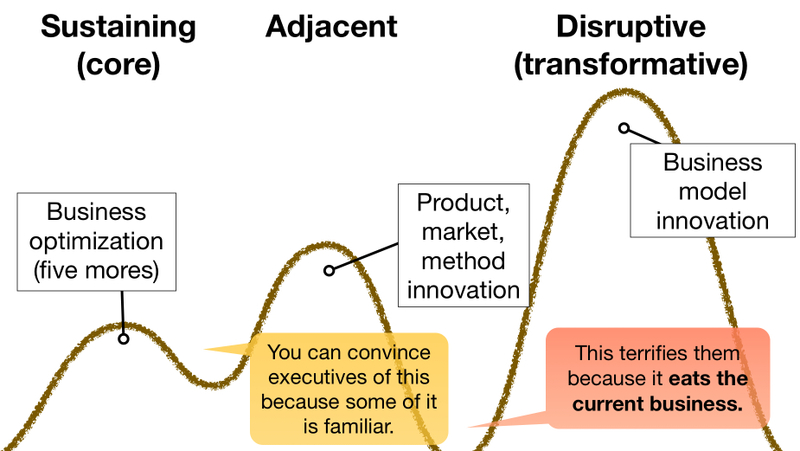 Now I know what disruptive tech really means, and I think you are spot on that it is not popular in practice because it destroys the current business and is a leap into complete unknowns. Just one question, how could Car2go ever destroy the dealership network? People are always going to want to buy big shiny sedans, not sure how access to smart cars could ever prevent that, no matter how convenient… Self-driving cars on the other hand, now *that’s* a truly disruptive technology we are only beginning to imagine the impacts of.